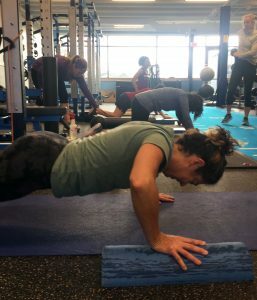 Kim Souza was looking for a training program that included a motivation, weight loss, strength and cardiovascular conditioning, and nutrition in a non-competitive, small group. The Hartford Village, Vermont resident found that program in the Shed and Shred at Upper Valley Aquatic Center. Souza decided to give the program a try after she witnessed the positive results a friend was having swimming at UVAC. “I saw his excitement and how much energy he had with his new routine,” she said. “But I’m not a swimmer.” A recreational athlete on the North side of 40 couldn’t say enough about the program, “Shed and Shred was the perfect balanced program for me,” said Souza. Souza, who owns Revolution, a hip clothing store selling vintage and consignment apparel and up-cycled accessories in White River, is looking forward to Shed and Shred Revolutionized starting in November. A new 30-minute complimentary nutrition consult offering nutrition essentials and education on healthy eating, are now available via FaceTime, iMessenger, or Skype. There’s also a discounted Shed and Shred Nutrition Consult package.